The Weslo Momentum CT5.0 elliptical offers a few more features than what you usually find on a low-end crosstrainer, but keep one thing in mind: it is still a cheap machine that is not worth the price. The LCD display window shows speed, time, distance, pulse and calories burned. The Weslo Momentum CT5.0 elliptical has an RPM meter and Target Pacer indicator light, both which can be used to track your workout effort to see if you need to pick up the pace or slow down. Trainers and equipment pros warn people that a compact elliptical with an exceedingly short stride length will not be ergonomically comfortable for most users. The average stride length for a home machine should be at least 18". The short 14" stride on the Weslo Momentum CT5.0 elliptical feels choppy with an up and down motion, and not at all like a smooth oval glide. This length is one of the most important features to consider when buying a crosstrainer and should not be compromised because of the price of the machine. There are mixed elliptical reviews on the Weslo Momentum CT5.0. Most of the positive comments are written by new owners who haven’t had the machine longer than a couple of days. The lukewarm and negative comments are from customers who have issues with the poor quality design, workmanship, and cheap parts: they report that holes for bolts do not line up easily so assembly can be a problem, and that the bushings need to be re-greased often (every few weeks) to keep the machine from squeaking loudly when in use. Another crucial issue with the Weslo Momentum CT5.0 was that consumers have discovered that replacement parts are expensive, costing as much as $100, which negates any savings they had for buying a cheap elliptical in the first place. Weslo has cornered the market on elliptical trainers selling for under $300, putting out at least a half a dozen models to lure an unsuspecting public into settling for low quality. 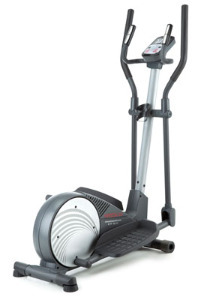 These low-end ellipticals are covered by a brief 90-day warranty for the very reason that they will and do break down. You will be sorry you wasted your money on the Weslo Momentum CT5.0. The minimum you should spend on an elliptical is $500, a range dominated by Proform. If you can go just a little higher to around $650, you have a choice among better machines built by ProForm, NordicTrack, Schwinn, and Ironman. At $299, the Weslo Momentum CT5.0 elliptical trainer is just as bad in design as its less expensive siblings that sell for $199. We advise you to stay away from cheap ellipticals and wait until you can spend a little more for a better machine.